With its single-feed design and compact size, the SmartSource Micro Elite may be the perfect remote deposit capture scanner for low-volume environments. Measuring just 7 inches by 4 inches, the Micro Elite’s footprint on your desktop is not much bigger than a smartphone’s. And at a rated speed up to 45 documents per minute, it can handle checks and deposit slips just as fast as you can put them in. 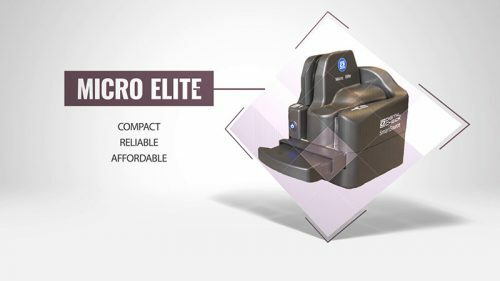 The Micro Elite delivers a great balance of performance and price for your remote deposit capture operation. Now available with onboard API and optional inkjet printer – see below for details! The SmartSource Micro Elite is actually taller than it is long. At just 7 inches by 4 inches, it’s roughly the same size as a DVD or a postcard. 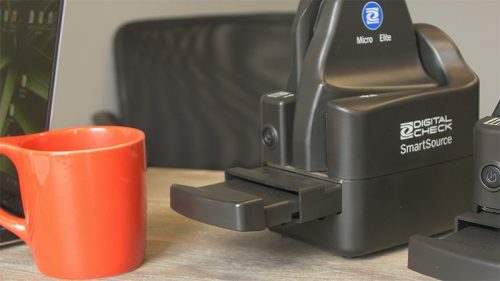 Besides standard checks and money orders, this scanner can also accept ID cards and capture certain items in full color.